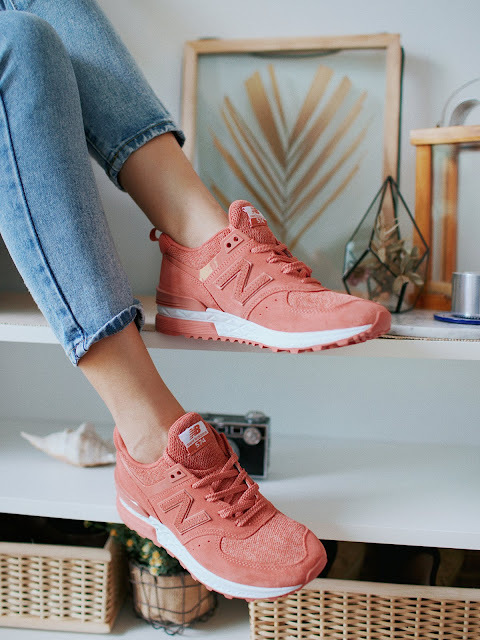 New Balance 574Sport | Manda. I feel so blessed whenever brands want to collaborate, really. I also feel extremely blessed when I get to work with Vivi because her photos are always so on point. We decided to do an indoor/at home photoshoot for these shoes because they are a lot more casual than the previous one (see previous blog post). We were going for a home-y setting with drapes/beds and all that good stuff. If you're wondering about whether to get the shoe, in my (very honest) opinion, they are not as comfy as the 247 series. This is because the 247 is foam based and cushions every step. This shoe, however, is a lot more on aesthetics and class. You can see that there's a mix of suede looking material and fabric (?). It's really when you mix materials that you make your outfit look special. With the whole atheleisure trend, it's great if you're good with tights, denim, tshirts, tshirt dresses.. I could go on listing forever but you get the gist!